My mom makes this cranberry wreath and it always looks nice against our white front door. I think she even made the bow! Around this time of year in Ann Arbor, I used Christmas shopping to procrastinate studying for finals. I would bundle up in my big puffy coat and trudge down to Main Street, where the trees were always lit up and the stores were decorated for the season. It got me into the spirit of the season more than sitting on the couch writing papers did, though the lights up around our living room on Hamilton Place were always bright and helpful. I'd walk in the front door and have this waiting for me. My roommates were (and still are) the best. Christmas Eve is one of the few traditional celebrations in my family. All of my siblings come over and my dad makes polenta for dinner. Polenta is a dish made from corn meal, water, cheese and butter. It takes some time, since you need to heat and stir the ingredients until the mixture becomes mostly solid. When my dad was growing up, his grandmother would make polenta in a huge copper pot whenever he and his parents came over for dinner. To serve it, she would flip the pot upside down on a towel in the middle of the dining table. Everyone would cut a piece from there. In order to celebrate our French heritage – my grandparents emigrated from Europe in the early part of the twentieth century – my dad makes polenta on the holiday we always spend together. It’s the one part of my French heritage that has survived through the years. Unlike my grandmother, though, my dad serves the polenta on a plate. Part of the reason I enjoy the series Mad Men is the show’s commitment to creating an accurate picture of the 1960s. The writers tie historical events into the show’s plot well, and as the series has continued from 1960 through 1964, the Cuban Missile Crisis, the Kennedy assassination, the Civil Rights Movement and even Marilyn Monroe’s death have been in the background (and sometimes forefront) of episodes. One of the best parts of this is that it gives the viewer an opportunity to see how people in that time reacted to the major changes happening across the country. In particular, women slowly gained access to new opportunities. The show explores these through the women of Mad Men, particularly Joan Holloway, Peggy Olson and Betty Draper, demonstrate the different ways women reacted to these changes. The writers have done a good job of exploring the changing role of women in the 1960s. Though many of the secretaries seem to exist only so that Don Draper can sleep with them, the three main female characters are more representative of the complex choices women had at the time. While the women’s movement had started to garner national attention after WWII, especially after the publication of The Feminine Mystique by Betty Freidan in 1963, the 1960s were a transition between an era when women were expected to get married and start a family by age twenty-two and an era where women had a greater range of choices. Betty, Joan, and Peggy embody those choices and the challenges that came with them. On Sunday mornings when I was little, my dad always read the comics pages to me. We'd laugh at Garfield, wonder what would happen next with Spiderman and puzzle over Zippy (I still don't understand Zippy). 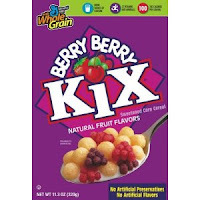 I would always pour myself a bowl of Berry Berry Kix for breakfast, then I would sit and listen to my dad read the bubbles over the character's heads. By the time I turned back to my cereal, it was a big pink and purple mush that I wouldn't want to eat. After a while, my mom started refusing to buy Berry Berry Kix.